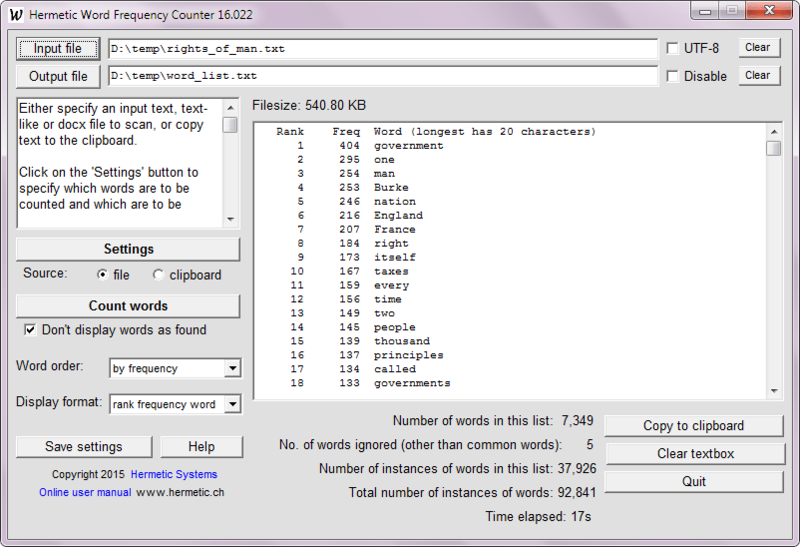 Count word frequency in text. to those taking a quick look at this file just to get started. programs, input to a style analyzer, or whatever. prepare the standard ASCII text file you wish to feed to WdFreq. looks OK, WdFreq can probably read it all right. type WDFREQ at the DOS prompt. \subdir\subdir .. , up to 64 characters. file with its word count -- so keep your head about you! free as he allocates space for his internal table. room" and again allow you to abort the program with . however, you may want to break the text into smaller pieces. XT (V-20 chip) with a fast hard disk. FSORT, available on many bulletin boards. distributed without any warrantee, liability, or guarantee whatever. for it except by us PussyCats. good example of elementary hash-table and linked-list processing. 869-2297 between 5 & 9 pm. This has been a commercial announcement.